Thursday’s release of state income data from the American Community Survey (ACS) showed that the gradual improvement in state economies from 2013 to 2014 brought little change in overall economic conditions for households in most states. 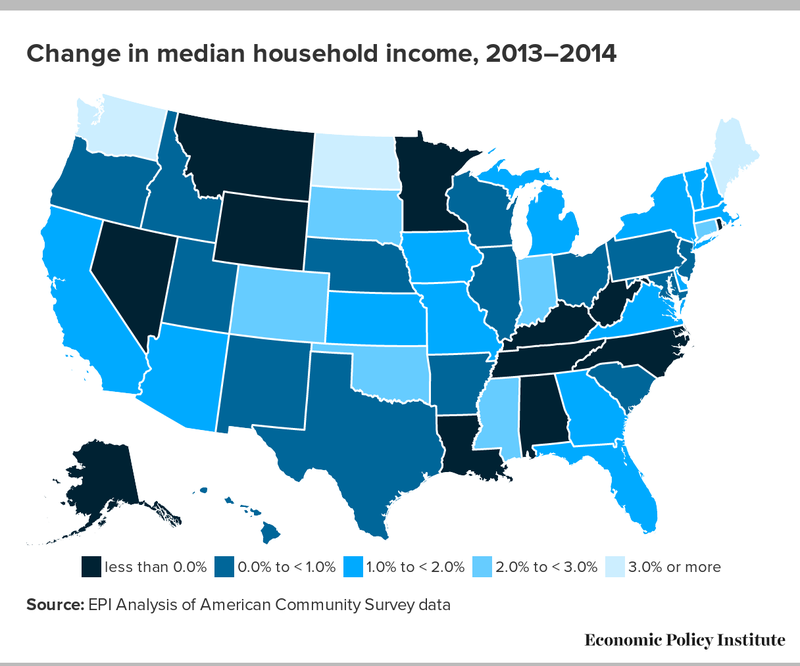 The ACS data showed a slight increase in median household income for the United States overall and similar modest increases in household incomes in a majority of states—although only a handful of these increases were statistically significant. By and large, what little improvement in household incomes occurred tended to be in states where incomes were already relatively high or where the oil and gas boom has fueled growth. Higher income states in New England and the mid-Atlantic, as well as Washington state, experienced modest gains, while incomes elsewhere were essentially flat. Kentucky (-2.6 percent) was the only state where household incomes significantly fell. After adjusting for inflation, the largest year-over-year percentage gains occurred in Maine (+3.6 percent), Washington (+3.4 percent), Connecticut (+2.7 percent), and Colorado (+2.5 percent). The District of Columbia (+4.3 percent), North Dakota (+4.2 percent), and Mississippi (+2.8 percent) also had relatively large increases, although these changes were not statistically significant.